goddamn what a tiny little thing, awesome work, you must have the eyes of an eagle!!! Great way to do it, I will definalety have to test this technique at some point. 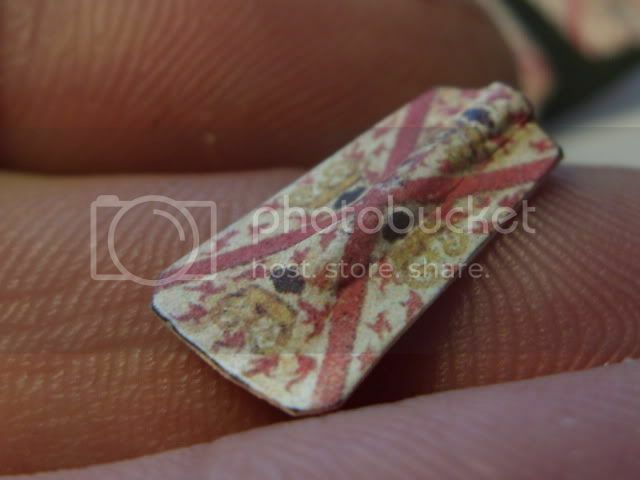 Yesterday I made 15 in about 1/2 an hour...The deisgn I found is for Burgundian 1450 troops. You can get the same design for 28mm´s as a decal...Perrys but i didn´t want to buy them, photo copy and print becuase of copyright . It´s quite simple really. The splitting of the cocktail sticks takes seconds and you get 4 halves, the rough cutting out of the "prints" a minute or two, the sticking down, each one a minute for both sides and the final cutting out when dry and the edging with the pen about 10 mins again. I didn´t time myself, but I did the sticking when there was a programme (The archers BBC R4 198 LW) on the radio that lasts about 1/4 of and hour and the cutting out I did about an hour later, and that took no time really.